Reviewing Authority's Recommendations: 1. 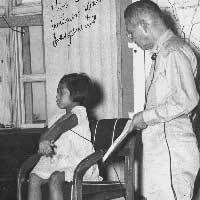 "Even supposing the act charged to have been in fact a so-called mercy killing, however, it was none the less a crime under the Geneva Conventions, under International Law, and even under the Japanese Criminal Code....While evidence of accused's motives may well be considered in connection with clemency, in that they mitigate the subjective guilt attached to an unlawful killing, they do not alter the fact that accsed committed a crime." However, the reviewer find that had it truly been a mercy killing, according to a Bushido Code, the act would have taken earlier rather than when the flyer was unconscious, there would have been an honorable disposal of the body, and it would have been a private affair, not done to the "laughter, applause and shots accompanying it." Furthermore, the conduct of the accused after the incident and after the termination of hostilites and upon learning of the discovery of the body shows that he was not "sincere" in their claims that they were "motivated by what to them were high ideals." Defense Arguments: 1. Decapitation was an act of mercy. 2. Bayonetted the body because "he had never been in combat nor had he ever pierced human flesh before. He thought the experience necessary to fit himself for the expected invasion."